It's true that the Galaxy Tab A 10.1 is a rather old tablet and probably obsolete hardware-wise, but for less than $200 it might worth a try. Two years after its debut in the United States, the tablet still sells for around $250-$280 outright. However, Best Buy has decided to make the Galaxy Tab A 10.1 even more appealing. 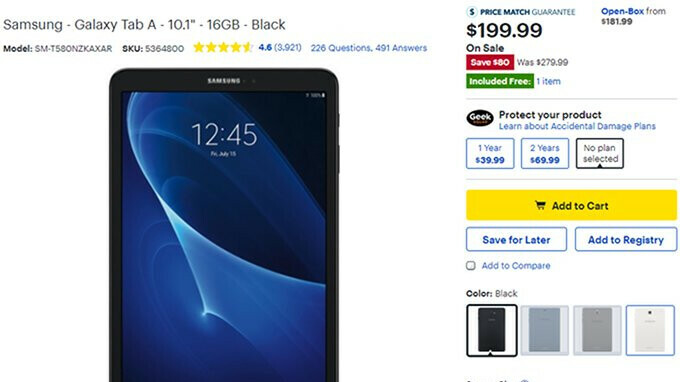 Until the end of the day, the tablet costs just $199.99, so customers would save $80 if they purchase Samsung's Galaxy Tab slate. It's worth noting that the Black color variant is the only one that's on sale, so don't try to get the White model unless you don't mind paying the full price. The Blue and Titanium versions aren't available for purchase at Best Buy any longer. The Galaxy Tab A 10.1-inch is a mid-range tablet that packs a 1.6GHz octa-core Exynos 7870 processor, 3GB RAM, and 16GB expandable storage. Also, the 10.1-inch display features 1200 x 1920 pixels resolution. Back in 2016 when the tablet was launched on the market, it came with Android 6.0 Marshmallow on board, so that's what you get. Other highlights of the slate include an 8-megapixel rear camera, 2-megapixel selfie snapper, and 7,300 mAh battery. A great deal on a great tablet. It's not great unless it's the S series. It should never cost over $200 in first place. Sorry! I would agree if storage were 32gn or more. 16gb is just horrible. I hate how you guys sort of click bait. It's 1 penny under $200. After tax, it can be $217 in some areas in the US. Decent deal, but still not worth it.